The Kanguru DVD Duplicator is a high-speed, stand-alone duplication system with a feature rich LCD. 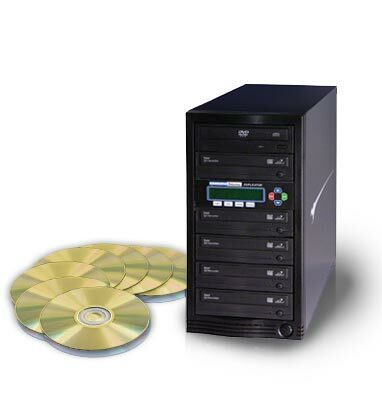 The 24x burn speeds make it one of the fastest DVD duplicators on the market today! Insert a master DVD or CD and a blank disk to make copies at the touch of a button, itâ€TMs that easy! A user-friendly LCD interface allows for Copy, Compare, Copy and Compare, Test, Test and Copy, Mix Audio Tracks, Erase and Auto Copy functions. The Kanguru DVD Duplicator is also compatible with CD+G, VCD, ISRC and more, allowing you to have every major format at your disposal! You can also create custom audio CDs mixes from different audio CDâ€TMs, making custom CDs faster and easier! As an added benefit the Kanguru DVD Duplicator can also be connected to any PC or Mac through a USB port for custom burning.